I first came to Costa Rica in 2003 on vacation. A couple of friends in Sarasota (where I lived) kept bragging about the beaches and the fishing, particularly in the southwest quadrant of Costa Rica and, more specifically, in Quepos and Manuel Antonio (QMA), and I felt compelled to investigate. I made eight trips to Costa Rica over the following five years until my retirement in 2008 at age 65. I saw other parts of Costa Rica but always ended up in QMA. On the last two visits I found myself having great difficulty returning to the States because I felt so comfortable here. That’s when I decided that I wanted to start my retirement here. It felt right to me but I had no specific intentions on what style of living I would eventually choose; I intended to test the waters first. I roomed for two months with a friend I’d met on earlier trips. One afternoon I was sitting in a sports bar in Quepos, deep in discussion with other expats, when I mentioned I was looking for something more permanent. “There’s a condo at my place for rent,” said one gent. And later, I investigated it and signed up. I hoped it would be a good place to live for a few months until I found something more permanent. Nine-and-a-half years later I’m still in the same condo. I live in a compound in the heart of Quepos that consists of seven condos and a villa, in which my landlord and his family reside. My condo consists of a large kitchen and bedroom and bathroom. There’s plenty of space for my computer and “mini-office.” I started writing a monthly newsletter I call the Golden Gringo Chronicles when I first got here and I’ve just published the 115th edition. Researching the topics for it has helped me learn more about Costa Rica…and the more I learn, the more I like. The rent on my air-conditioned apartment is $300 a month, including cleaning service. Other fixed expenses include electric ($40 to $50), telephone ($15 to $20), health care ($80), food/consumables ($30 to $400), and eating out once or twice a week. When I moved here, after 50 years of continuous car ownership, I decided to go without a new one for a few months to see how problematic that would be. After nine years I still don’t own a car but I do maintain valid driver’s licenses in both Florida and Costa Rica. Occasionally I use them to rent a car for certain trips. The combination of low housing rental and no car expenses provides a little extra “mad money” for trips and I’ve been to four other Latin American countries with a couple of more planned. I love the convenience of living in Quepos, where I can walk to just about any store or office in less than 15 minutes. My doctor also likes the idea that I walk a lot. The good bus system cancels the need for a car and there are many recreational venues within a short bus ride. 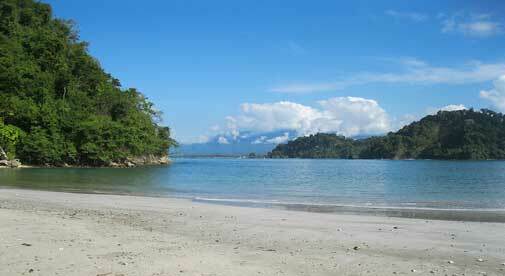 I enjoy the beach frequently (15 minutes from Quepos by bus). Best of all, now that I have a residence document, local busses are free and long hauls are a 25% discount for seniors. My landlord and his family have become my Costa Rican family. When I first came here in 2008 they had three boys, 10, 15, and 20 who are now all nine years older. I hit it off particularly well with the boys and especially the middle son who was excellent in English. Now I use my faulty Spanish to communicate with them all and they smile. I was in my apartment for about a year when I turned to my landlady at a family party one day and said: “You know I have no grandchildren; these boys have become my grandkids.” She smiled and said, “I know.” Put a value on that if you can. Likewise, I’ve made many tico and expat friends here over the years and when I walk through Quepos on any day I will meet someone I know on every block (it’s the small-town thing). If you happen to be looking for a simple lifestyle in a place of incredible natural beauty and friendliness I can testify that Costa Rica and Quepos and Manuel Antonio has everything you’re looking for.